Say Ni Hao (Hello)Chinese Translation SolutionsIf you are looking for a Chinese translation services that deliver on-time high quality translations, LanguageTran has the solution you have been looking for. We work to help businesses, agencies and individuals translate all commercial files (text, audio, video, website and software files) into and from all Chinese dialects. Our highly-skilled translators are among the best in the industry. They are highly educated individuals with many years of experience. Besides highly accomplished linguists, many of our translators have degrees in specific fields such as science, engineering, law, medicine, and computers. Our translation agency believes accurate Chinese translation services play a critical part in conveying the right messages across the language divide. All of our work is proof-read by qualified editors to insure that the meaning of the original content is accurate. This is especially important in critical fields where a slight variation in the interpretation of language can make a difference between successful communications and huge misunderstandings. Our translators, editors and project managers follow strict quality assurance procedures to render well translated and properly texts. All of our translations are done by professional translators, not unreliable translation software. Our goal is to produce accurate translations that read as if they were originally written in the target language. Localization is important for Chinese speakers because there are seven main and three newly recognized dialects in Chinese. 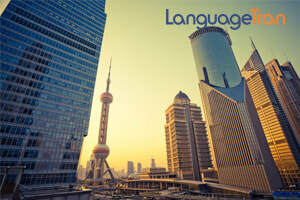 LanguagetTran’s Chinese translation service takes these different dialects into considerations and customize their work to communicate effectively with your target audience. LanguageTran strives to provide our customers affordable Chinese translations. Instead of cutting corners and sacrificing quality, we use state-of-the-art tools and techniques to help you stay within your budget. China is the No. 2 Economy in the World and Chinese is the No. 2 Language in the Internet. We seem to hear News from China every day and it is not a secret that China is an economic and manufacturing powerhouse. As the second largest economy in the world, China represents one fifth of the world population, almost 1.3 billion Chinese people. For businesses, this translates into huge potential economic and cultural opportunities. And as far as reaching clients in the Internet, Chinese is only second to English with 449 million Chinese speakers and Web surfers online. If you are doing business with China, chances are that you need well-written, accurate and clear translations. Our team of professional Chinese translators, project managers, typesetters, audio, videoand software engineers can help you take advantage of the opportunities that this market has to offer. FAQ – Which Chinese dialect to use? There are many dialects in China but there are only two standard character sets which are common to all of them, Simplified Chinese and Traditional Chinese. Traditional Chinese refers to the characters used in pre-revolutionary China. Today, they are used in Hong Kong, Taiwan and the Chinese diaspora. In an effort to promote literacy, the People’s Republic of China undertook the simplification of traditional Chinese characters. They created the Simplified Chinese character set, which today is used in mainland China and Singapore. The decision of which character set to use is based on who your target reader will be.